Harry Potter's treatment of owls might not be so magical. The live owls used at the Warner Bros.' studio tour are kept in undersized cages where they chew at their tethers and shake their heads from stress, according to a recent investigation by PETA that's caused Warner Bros. to announce a "review" of the owls' conditions. The animal welfare organization sent an investigator to visit the Hertfordshire, England, studio lot in February after it received complaints from visitors saddened by the treatment of the birds. The footage shows the owls being kept in tiny cages where they're unable to spread their wings. One shot shows an owl trying to chew off the tether around his foot. In another shot, a small white owl tries to climb up his bars but flaps uselessly down to the cage floor, while visitors gasp. The throngs of visitors are also allowed to use flash photography, which the trainer claims won't bother the owls. While it's been disputed whether flashes distress owls, some of the birds appear a bit ruffled at the lights and background music. When one bird is out of his cage, visitors are encouraged to touch him, despite the owl flapping his wings and looking visibly uncomfortable. "He doesn't really care," the trainer says. "They don't understand anything. They don't know about - " before being cut off. The same trainer tells the crowd how he obtained one of the exhibit owls for around $20 when the bird was just 2 days old. "He was going crazy in the box," he says. "He still had eggshells on him." In a post, PETA said that the owls were "clearly distressed" and that the trainer displayed "gross negligence." Warner Bros. clarified that the birds visited the studio only for "short periods" and are handled exclusively by experts, according to the BBC. Both Warner Bros. and the company that owns the birds, the California-based Birds and Animals, have announced they will review their practices and that the welfare of the birds is their top priority. Warner Bros. studio tour representatives did not immediately respond to The Dodo's request for comment. "If it is true that anybody has been influenced by my books to think that an owl would be happiest shut in a small cage and kept in a house, I would like to take this opportunity to say as forcefully as I can: please don't." 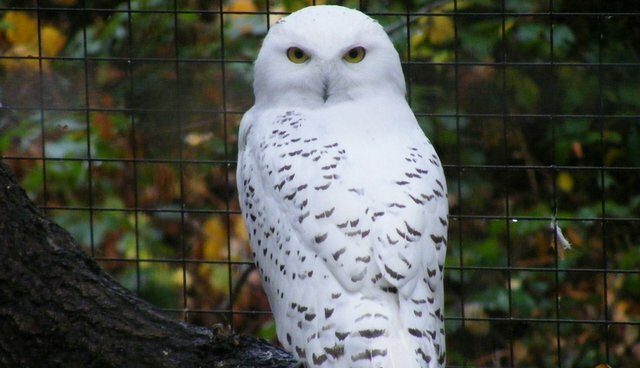 However, in the years following the Harry Potter books' releases, wildlife rescues noted an increased interest in owls and saw a huge surge in the number of abandoned owls, as fans obtained the wild raptors as pets and quickly dumped them when the novelty wore off.